Brainstorming is a crucial strategy for a successful business. If you’re not brainstorming, you are missing out on an incredible opportunity to expand not only your company, but also your way of thinking. Group brainstorms are my absolute favorite; they provide our team with fresh, unique ideas that augment our branding and marketing efforts. I see brainstorming as a ‘safe haven’ for myself and my coworkers to speak what’s on our minds regarding our current strategy, and how we can improve. Two weeks ago, we had a Global Marketing Conference with our marketing teams from the US, the UK, and Canada. Just within the brief two days we spent discussing ideas and voicing concerns, we were able to better our understanding of what works, what doesn’t, where we should delegate our time, and the best practices for marketing our products. In two days, we better understood not only our co-marketers, but also our brand as a whole. Brainstorming is extremely effective, if you know how to do it. No matter which aspect of your business is the focus of your brainstorming, establishing a firm direction is the only way to go. Make sure your goals are set before you enter the brainstorming session. It is best to select a moderator for the brainstorming session, it would be their job to determine the direction of the brainstorm, and set the goals for the group. If you do not set a distinct amount of time for your brainstorming, you could actually hinder your productivity! There is such thing as too much brainstorming. Setting a time limit for your brainstorming will encourage time-management, less idle chit-chat, and structure. My suggestion is to keep your brainstorming sessions to a maximum of 1.5 hours, any longer and you have a decreased engagement. Take note of everything that is said in your brainstorming session! Whether it be an aimless thought, a brief suggestion, or an in-depth analysis of a particular strategy, you need to put it on paper (or on a whiteboard). Who knows what minute comment may have a significant impact on your future strategy? Leave the office for a breath of fresh air. 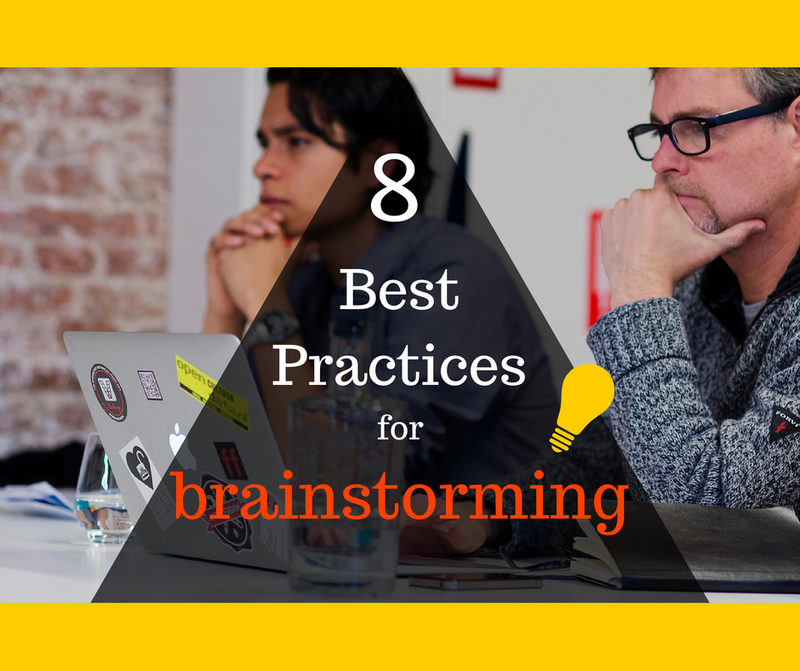 The more creative your brainstorm participants, the more beneficial your session will be. If you step out of the office to brainstorm, it gives your participants a breath of fresh air, that may be the difference between an inspired idea and a mediocre idea. One of the most effective tactics for developing a successful business strategy, is monitoring the success or the blunders of your competitors. Brainstorming sessions are a fantastic way to act ‘as if’ you are your competitors; role play particular scenarios to determine which tactics will work, and which won’t. If you had no limits, no budget, no boundaries, no shared market space, what would you do? You should designate time to assessing just what you would do if you had unlimited resources. Though your ideas may seem far-fetched, some of them may be toned down to create a more attainable strategy. Create a thought-map to monitor your group flow. Once you have put every thought down on paper, it might behoove you to put your ideas into a thought-map for easy navigation in the future. The more cohesive your thought-map, the happier you will be with yourself in the future. Don’t be afraid to be a copycat. If people and corporations didn’t copy each other, we wouldn’t make any progress. Why? Because when we copy ideas, we figure out what works and what doesn’t so we can improve the idea. Take a look at what companies are excelling in your industry, and copy what they are doing. Also, take a look at what those companies are doing wrong, and make sure to correct the problems in your own strategy.